CINCINNATI (AP) — Bobby Hart tops the Bengals‘ initial depth chart as the starting right tackle, but it’s more of a first draft than a final report. No part of the team will be under closer scrutiny than the offensive line when Cincinnati hosts the Bears on Thursday. The line became the offseason priority after the Bengals (7-9) finished last in the NFL on offense for the first time in franchise history. The line was the biggest problem, creating few holes for running backs and giving Andy Dalton little time to throw. Two weeks of training camp started sorting it out, with Hart listed as a starter for the moment. That could change quickly with a bad performance, dropping someone to the second unit. 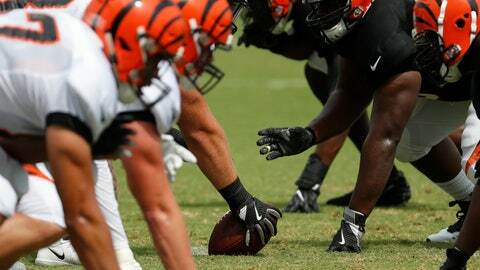 “There is not a ‘first’ offensive line,” coach Marvin Lewis said Tuesday. Hart was the first move in changing the line. The Bengals signed him Feb. 14 as a free agent from the Giants, where he started 21 games at tackle over the past three seasons. He’s competing with Cedric Ogbuehi at the spot. Ogbuehi was a first-round pick in 2015 when he was recovering from a torn ACL. He started 12 games in 2016 at right tackle and 13 last season at left tackle, but struggled at both spots. His competition with Hart at right tackle will come down to how they perform in the preseason games. Hart’s experience helped him get the early edge. One of Cincinnati’s biggest moves in the offseason was trading first-round draft slots with Buffalo to obtain left tackle Cordy Glenn . He’s backed up by Jake Fisher, a second-round pick in 2015 who started seven games at right tackle last season before a heart condition required a procedure. Left guard Clint Boling is the main holdover on the line, entering his eighth season — the past six as a starter. Trey Hopkins returns at right tackle, where he started the last 11 games last season. The Bengals’ other big move to upgrade the line came in the draft. They took Ohio State center Billy Price in the first round and installed him as the starter. He had some problems with snaps early in camp. The coaches would like to have the competition sort out so they can get their starters enough playing time together during the preseason. DARK CLOUD OVERHEAD: A downpour 45 minutes into practice forced drenched players to head for cover at Paul Brown Stadium. Practice resumed about an hour later in a steady rain. The Bengals are the only northern NFL franchise without their own covered practice field. NO BURFICT: Lewis said Vontaze Burfict won’t play Thursday. The linebacker wasn’t cleared to practice until Monday because of a hamstring problem. Burfict is suspended for the first four games of the season because he violated the NFL’s policy on performance-enhancers. WHAT ABOUT EIFERT? : Lewis declined to say whether tight end Tyler Eifert will play against the Bears. He was held out of the start of camp as he recovers from chronic back problems that limited him to two games last season.